Synth Hacker: Polysix - Adding "Detune"
After adding the hardware and software to implement aftertouch vibrato and portamento, I realized that I could command the Polysix to do all sorts of arbitrary pitch-manipulation effects. With just a little bit of additional software, I could do pitch bends, pitch wobbles, pitch slides (hence the portamento), pitch transposition, or...wait for it...pitch detuning. I love the detuned unison sound on my Mono/Poly and now I can get it on my Polysix! It should be noted that the Polysix already has a little detuning purposely built into its Unison mode. The circuit below is on the KLM-366 PCB and is only active in Unison mode. 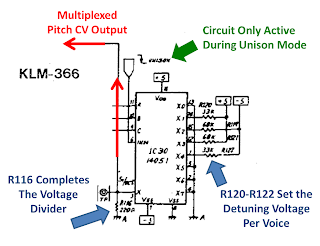 Via voltage dividers (R120-R122 per voice combined with R116 for all voices), this circuit generates a small voltage that is used to shift the pitch of each voice to be a little sharp or a little flat. By looking at this piece of the schematic, it looks like this circuit leaves Voices 1 and 6 unchanged. It appears to shift Voices 2-4 up or down by between 16 and 33 mV. 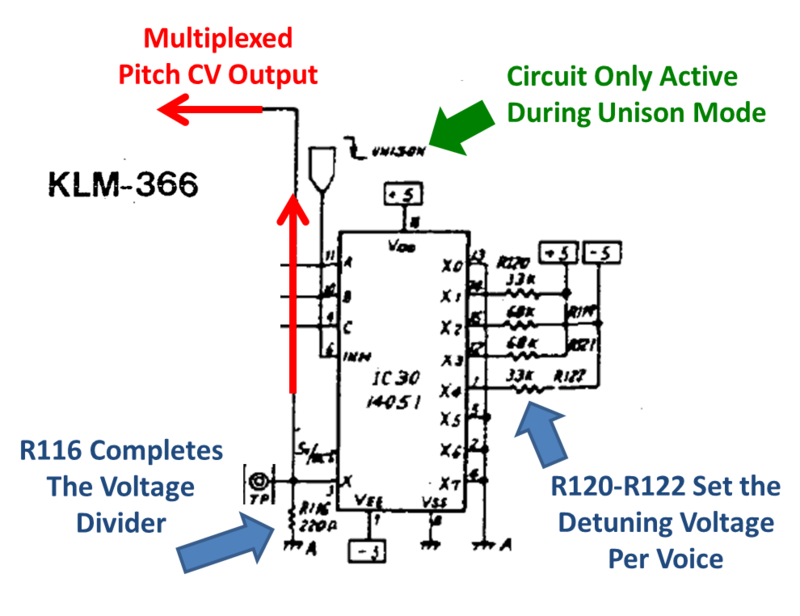 The schematic says that the pitch scale is 5V/oct at this point, so the per-voice pitch detuning is about 4-8 cents (4-8% of one half step). While that's enough to give a nice little swirl to the Unison mode, it doesn't give that meaty, fat detuned sound that has become popular in some electronic dance music styles. I intend to change that. In terms of approach, one could simply modify the existing circuit. By replacing R116 with a bigger resistor (say 400-600 ohms), the detuning would get much more intense. It would still be a fixed amount of detuning, but it would be a very easy modification. The down side is that it is not adjustable (unless you wired in a potentiometer) and that it only applies to Unison mode -- it is not usable by Chord Memory mode. Since I already have my Polysix modified with an Arduino and a digital-to-analog converter (DAC), I can do arbitrary pitch shifts and pitch bends on a per voice basis in any of the Polysix's modes of operation. That's a lot of pitch-mangling power. So, I wrote a little bit of software that, when I commanded the Arduino to effect "Detuned Mode", it would command a slight pitch shift to each of the Polysix's voices. How much pitch shift per voice? Well, following from the Polysix's built-in detune, I left two of the voices at normal pitch and bent the other voices in pairs (one up, one down) to different degrees. The overall scale factor for the detuning I left as a variable that I could adjust on-the-fly so that I could control how much detuning I wanted. For my user interface, I've temporarily mapped "Detune Activate" to my Polysix's arpeggiator button. Pressing the arp button activates or deactivates the detuning. Then, I can control the amount of detuning by holding down the arpeggiator button and turning the arpeggiator's "speed" knob. My Arduino sees the button being held and sees the knob being turned and interprets that as a command to adjust the detuning. It works great! The spectrogram above really shows how the voices spread apart as the amount of detuning is increased. How does it sound? Well, the video is a demo of the audio coming out of my modified Polysix. At the very beginning, you hear me load up the six voices playing the same note. I lock in the six voices using the Chord Memory button. You hear that the voices are in pretty good unison. Then you hear me kick in the detuning. I like it a lot. Yes. A lot. More Info: Disabling the Polysix's built-in detuning to improve the control over the detuning amount. Update: I shared my Arduino code here.